The Astronomer’s two favorite foods are raspberries and cinnamon. 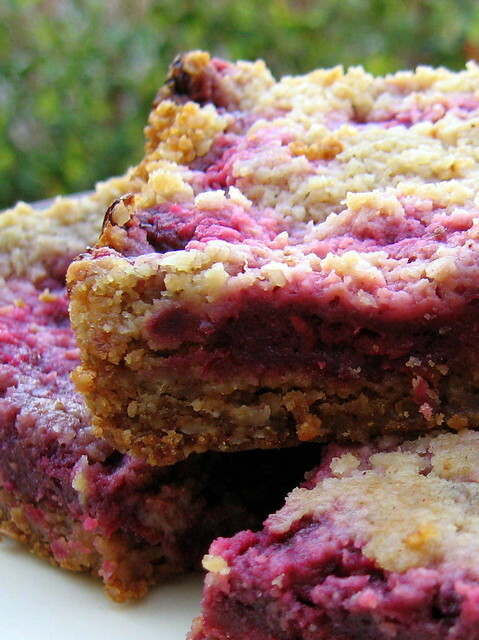 When I saw this recipe for Raspberry Crumb Breakfast Bars in the Baked cookbook, I knew it would make the perfect Valentine’s Day gift. Since I don’t own a 9-by-13-inch baking pan, I multiplied the recipe by two-thirds to fit a 9-inch square baking pan. These bars turned out fantastically—the crust is buttery and sweet, while the filling is perfectly tart. They’re great as a light breakfast with tea, a post-dinner sweet, or even midday snack. Happy Valentine’s Day! Preheat the oven to 350°F. 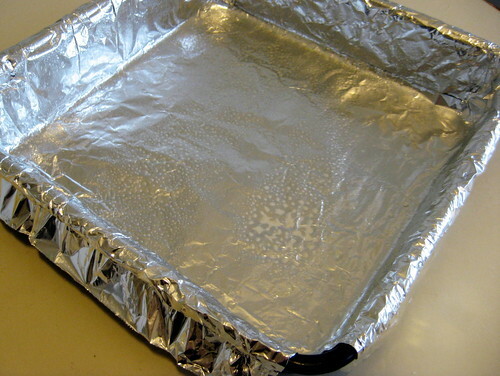 Butter the bottom and sides of a 9-by-13-inch glass or light-colored metal baking pan. Put a long piece of parchment paper in the bottom of the pan, letting the parchment extend up the two short sides of the pan and overhang slightly on both ends. 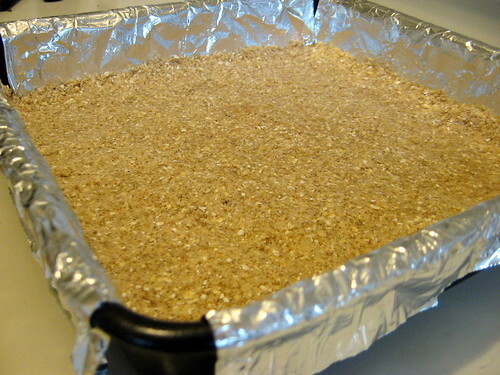 (This will make it easy to remove the bars from the pan after they have baked.) Butter the parchment. Note: I used an aluminum foil “sling” as advised in America’s Test Kitchen Family Cookbook. 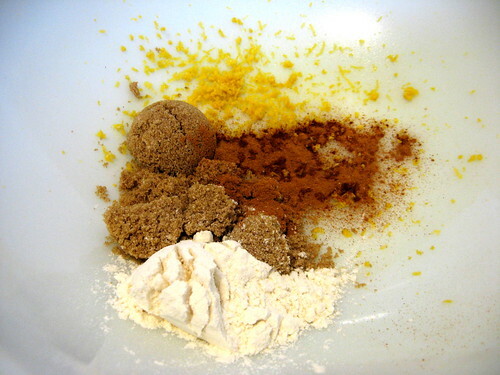 In a medium bowl, whisk the sugar, lemon zest, cinnamon and flour together. 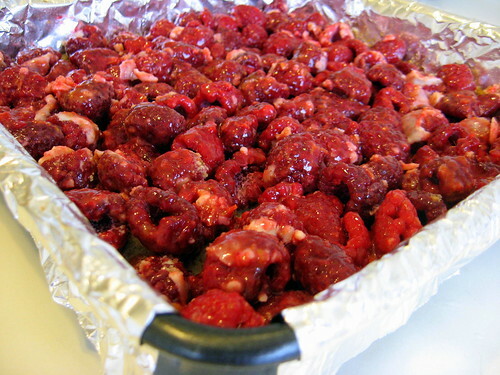 Add the raspberries, lemon juice and butter and use your hands to toss gently until the raspberries are evenly coated. Spread the raspberry filling evenly on top of the cooled crust. Sprinkle the reserved crust mixture evenly on top of the filling. Transfer to a wire rack to cool completely, then cut into squares and serve. The bars can be stored in the refrigerator in an airtight container for up to two days. I have wanted to post for some time- I always enjoy reading your blog and reading about my home. 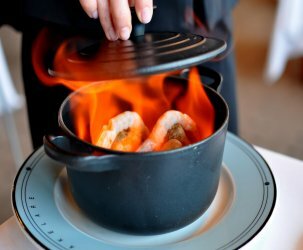 I was raised over the hill in La Canada, a stones throw away from many of the delicious restaurants you are discovering. I also worked at JPL for two summers as an engineering intern- I have quite a few friends at Cal Tech. Anyway, I currently attend college in Iowa (Grinnell College), so it is a pleasure to be able to see my home and live in the SGV through such a good blog as yours. Keep up the good work! Your math skills/thinking are waaaaay beyond mine! I was a liberal arts major. Wow. These look great! I guess I will have to go out and buy a food processor. I do have a 9 x 13 pan so I won’t have to do any math, which is good. I sent you some Sauce Foodie stickers via snail mail. 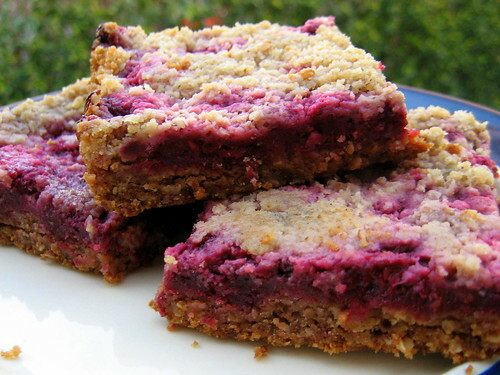 i am 15 years old and i eat oyur raspberry bars all the time and they are really but now sence i got the recipe i can see if i can make the bars my self,but if they don’t come out good than i will keep buying your raspbery bars. Ok, these are in the oven. They either smell questionable or I’m entirely too skeptical of what the girls I’m nannying are up to — I could have SWORN I smelled cigarette smoke, but it was just the bars. And now they don’t even smell cigarette smoke. Maybe it’s my own need to go to a smokey place for a nice drink – or 8. Either way, I’m super excited about these bars. Also, these people don’t own a food processor, so we tried the blender (which failed), then I let the little princesses squish the butter with their (CLEAN!) fingers. I used two knives to cut the rest up to make it more pea sized. IT took a minute, but it was way more effective than me continuing to search for a food processor that doesn’t exist. Oh. My. God. I’m rambling. I need adult interaction. 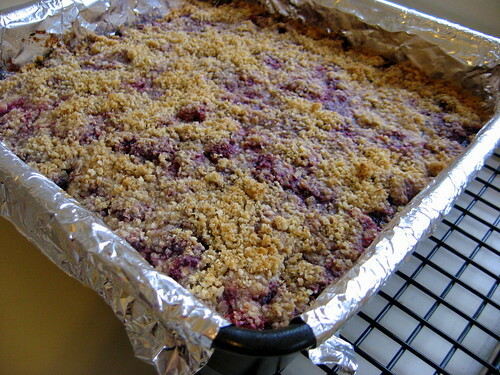 Maybe I’ll toss the raspberry bars down with a nice little martini — or just straight vodka. just made them, delicious but too sweet to have for breakfast. 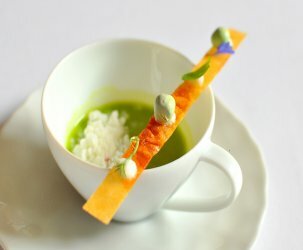 maybe as an afternoon tea snack though! We have many raspberry bushes, when they ripen this summer I will give this a try. Nic pics nice post! This recipe looks so easy.Love raspberries so I must make this for breakfast this weekend— raspberries are in season now. Went out to the golf course behind the house for a walk and found a quart of raspberries just waiting to be put in this recipe. 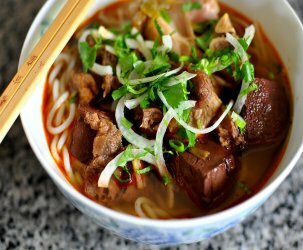 Really easy and taste great. Did it with a hand mixer and they turned out just fine. 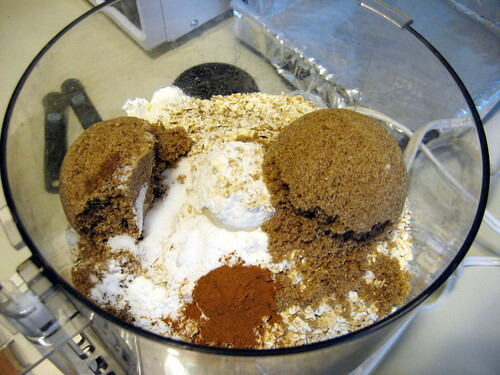 No food processor required! Loving the look of these bars!! Oh yeah, I could eat those for breakfast. Possibly all of them. PS: some of the pics don’t appear, don’t know why? hi what is the shelf life of these bars?? chandni – you can leave the bars on the counter for 2 days. Then, place in fridge.